Butters Pancakes Cafe is a very popular (and deservedly so) brunch destination in Scottsdale. The delicious food and beautiful outdoor patio make it a prime destination for casual weekend brunch goers. Butters is most famous for their diverse selection of sweet breakfast fare such as pancakes, crepes, waffles, and French toast. Here you can order everything from Oreo Cookie S'mores Cakes, to Banana Nut Bread French toast, to Strawberries and Cream Waffles, to a Nutella Crepe. Of course, you really cannot go wrong with Classic Buttermilk pancakes - Butters are so fluffy and delicious. And for the gluten-free diners out there, they offer GF waffles and pancakes! For those craving something a bit more savory, Butters offers a nice size selection of omelets, scramblers, skillets, and Benedicts. The garden skillet, which consists of green pepper, onions, tomatoes, spinach, and mushrooms, is pretty fabulous. In addition to your standard orange juice, butters offers smoothies, a selection of hot teas, and a decent size espresso menu. Butters makes all entrees from scratch, including the batter for the sweet treats. If you are avoiding red meat, they offer a number of substitutions including turkey bacon and chicken sausage. There are many vegetarian options and plenty of GF choices as mentioned above. Service is always great at Butters. 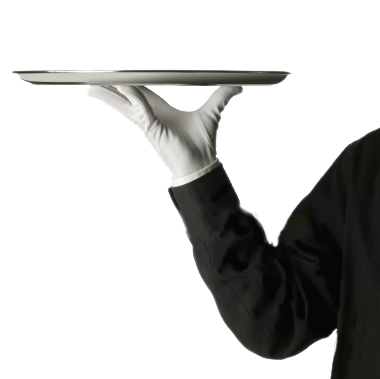 The waiters are friendly and happy and always seem to engage in small talk. While the inside decor is nothing to write home about, the outdoor dining area is really what sets Butters apart from the rest. The covered patio is beautifully landscaped with palms and tropical plants and faces a pretty fountain. It's one of the better patios in town, and is the perfect destination (during the mild season) for a leisurely weekend brunch. Butters is a great brunch choice for anyone visiting Scottsdale for the day. The menu variety, gorgeous outdoor seating area, and friendly service make it an easy pick before exploring the various attractions throughout Scottsdale and the Phoenix metro area.